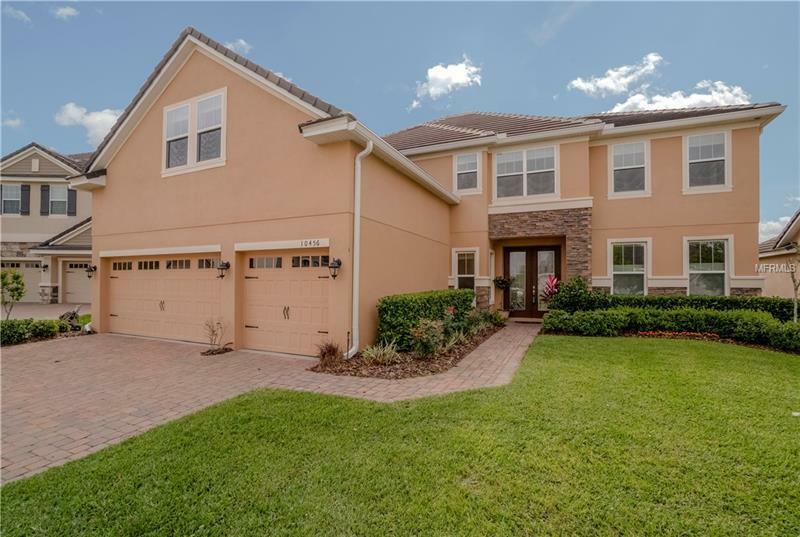 Enjoy private community access to the Butler Chain of Lakes in this gorgeous home located in the gated Provence at Lake Sheen neighborhood. Home offers an abundance of living space including a loft, a bonus room, and an office with a built-in desk and wall unit. A mix of wood and tile floors flow throughout the main floor in addition to crown molding. The family room features a stylish shiplap wood which adorns one wall and connects to the gourmet kitchen which is illuminated with recessed and pendant lighting and boasts stainless steel appliances, granite countertops, flat cook surface with range hood, 42â staggered birch cabinets with rope molding accents, a wine rack, tile backsplash, and an island for added work space. A large breakfast area overlooks the pool. Relax and unwind on the lanai while enjoying tranquil sounds from the poolâs water feature which is accessed from both the family room and the master suite which is complete with a walk-in closet and an ensuite with twin granite vanities, a garden tub, and a glass enclosed shower. Follow the double sided wood steps to the second floor from the kitchen or the family room where you are greeted into the oversized loft which connects to the four additional bedrooms and the bonus room. Other upgrades include an IntraSonic music system which allows you to play music throughout the home, an On Q Structured wire panel, paver driveway, entry, walkway and pool deck, double pane windows along with many other high performance home features.